I watched The Mask yesterday and thought it might be fun to realize Stanley Ipkiss as The Mask as one of Angus MacLane's CubeDudes. So here he is, "smoking!" with his iconic, baggy yellow suit and hat from the "Hey Pachuco" scene. 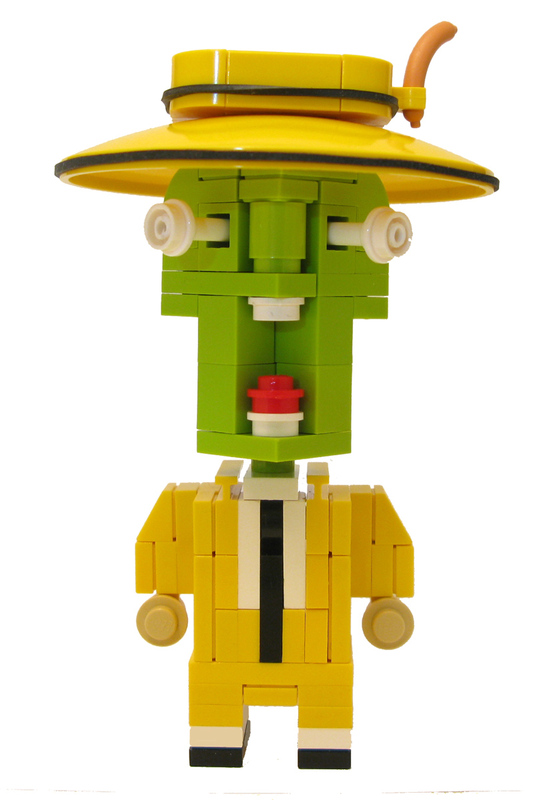 The character's cartoony ways were also fun to build. That movie's awesome! Great MOC! Great job on the hat! Excellent build! You caught the eyes popping out perfectly! Hahaha! I remember seeing that film a while ago...Very accurate build. Awesome job!!! Hat is the best part of him! Also... Is that your first cubedude? If yes, than AWESOME, if no than AWESOME!!! No seriously this is one of the best cubedudes ever!!! "You were good kid; real good. But as long as I'm around you'll always be second be..." Wait a minute, I could never be this awesome! I agree with the comment below; you did The Mask a great justice. Great work! P-A-R-T-why? Because I gotta! Slick cube dude, that is one of my favorite movies. Love the yellow suit, and nice effects on the face! What a fantastic idea! Great job! Love the eyes. I just crapped my pants! Nicely done. The pop-out eyes are great. Nice work, I love the hat! You have done the Mask a great justice. Jaw-dropping, eye-popping! Love the parts use with the sausage in his hat. The jaw-drop is an extra nice touch. Well done.